Some business problems are harder to fix than others. 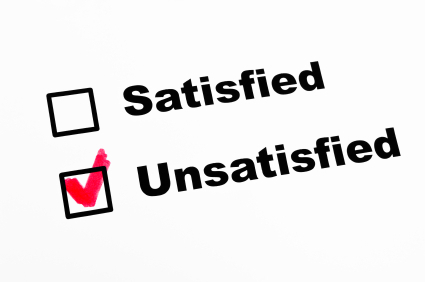 But very few problems can be as frustrating and difficult to address as an unhappy customer. That’s because there’s no single way to “fix” a broken customer relationship. Every situation — and every customer — is different. Success depends on your ability to listen, adapt, evolve, and rise to the challenge. Yet there are important techniques that every small business can use to win back unhappy or dissatisfied customers. Put these methods to work, and you’ll have the tools you need to turn even the most ardent critic into a loyal — and vocal — repeat customer. In today’s business climate, this could make the difference between success and failure for any small business. Once you discover why your customer is unhappy, it’s time to assess who, or what, is to blame for the problem. If a miscommunication occurred, for example, you’ll want to acknowledge that you or one of your employees could have done a better job of articulating a specific policy. If you did blow it with a customer, few things say you’re sorry like sending business to their door. Referring one of your own associates to a customer — former or otherwise — demonstrates that you have that customer’s best interests at heart. It’s also a subtle way of suggesting that it’s possible to move on and build a new business relationship. If you want to convince someone to give you a second chance, use language that not only persuades but also enhances your trustworthiness and real concern. Once you’ve offered a solution to the problem, sweeten the deal with a price break or some other special incentive. The “incentive” doesn’t even have to involve your own products or services; a gift certificate to a local restaurant, for example, is another option to consider. If you want to solve customer service issues, you’ve got to give your employees the power to fix problems and make things right. That’s especially true when it comes to dealing with unhappy customers. Assemble your fabulous sales team and create a campaign just for previous customers, particularly ones who left disgruntled or otherwise unhappy. Conduct the campaign via social media and in print to make sure you reach everyone. Tell customers you miss them and want to do something — whatever it takes — to get them back. At first, an unhappy customer who hears, “What would you like us to do?” or “How can we make the situation right?” might not actually pay attention. They may be so accustomed to being ignored that they won’t notice that you’re working hard to engage him and find a solution. But be persistent. If a customer requests something that is truly beyond your abilities, gently negotiate toward a middle point. Most customers will appreciate the effort, even if it takes them a few minutes to get over their initial anger — and fear of rejection. Once you win back that unhappy customer, do your best to keep them. Start out at once by expressing your appreciation, and never stop. Remind yourself from time to time why your customer became disgruntled in the first place. The last thing you want is to have to woo back an unhappy customer a second time!